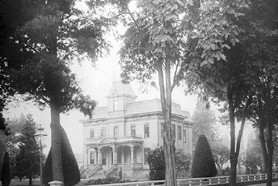 In 1889, Edward Churchill built this magnificent mansion on what is considered to be the original street of the Napa founders. Just north of Churchill Manor (toward Downtown Napa) was George Goodman’s lovely mansion, built in 1872. To the south was the Manasse mansion, built in 1886 by an executive of the original Sawyer Tannery. In 1891, Edward built another mansion, Cedar Gables, directly behind Churchill Manor facing Coombs Street, for his son as a wedding gift. These four residences together reflect the aristocratic lifestyle that existed in Napa during the late 1890’s and early 1900’s. Churchill Manor was the first residence in the Napa Valley to be listed on the National Register of Historic Places. The Goodman Mansion, Manasse Mansion, and Churchill Manor have qualified for listing on the National Register, and all four are Napa City Landmarks. In addition, they are included within the boundaries of the Napa Abajo National Register Historic District, formed in May, 1997. This District is the second largest in California, and comprises approximately 300 historic properties located on 29 streets extending from Jefferson Street east to the Napa River, and from Third Street south to Imola Avenue. With nearly 10,000 square feet of interior space, Churchill Manor is reputed to have been the largest residence built in the Napa Valley during the 1800’s. All of the interior woodwork of the mansion has remained essentially untouched. The first floor contains its original leaded and beveled glass doors which open into four grand parlors, each with a fireplace framed with ornately-carved ribbon-grained redwood mantels and paneling. The rooms are separated by three large doorways with massive solid redwood pocket doors concealed in the walls. The most exquisite of these pocket doors is created from museum-quality heritage burl redwood. The twelve-foot ceilings contain seventeen layers of detailed redwood moldings. Six solid redwood-fluted Corinthian columns grace the grand staircase and the music room. Miraculously, none of this outstanding woodwork has ever been painted! Edward Churchill and George Goodman built their outstanding residences as tributes and legacies for the City of Napa. The Napa River had become an active steamship route from San Francisco, with many San Franciscans sailing up the river to attend grand parties held at Churchill Manor. In addition to banking, Edward also owned the Golden Ribbon Beer Brewery of Napa as well as the Tokalon Vineyard near Rutherford. The Tokalon Vineyard now comprises approximately 700 acres of the Robert Mondavi Winery, the namesake of Mondavi’s “Tokalon Tasting Room,” and is reputed to be the oldest grape-producing property in the Napa Valley. In a grouping of three pictures across from the Registration desk, you can see Edward in his top hat standing along with the brew master and his assistants amid their beer kegs. Following Edward’s death in 1903, his wife and daughter continued to live at Churchill Manor. Around 1906, a major remodeling of the building was undertaken. The original home was designed in the Second Empire architectural style, a two-story symmetrical building with a mansard roof and a square central tower. Changes consisted of removing this tower and adding an expansive colonial revival veranda surrounding three sides of the mansion. The original cornice and brackets were duplicated in the second-floor porch addition supported by two-story ionic columns. A total of 22 ionic and Doric columns flank the veranda and kitchen porch. The original mosaic marble-floored patio was also enclosed to create a bright and cheerful solarium overlooking what was then the tennis court. The exterior wood siding was shingled and third-floor dormer windows were inserted into the mansard roof. Inside the mansion, gas was replaced with electricity and the third floor attic was finished off to accommodate overnight occupancy. 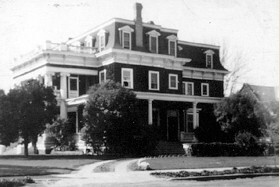 Around 1940, the second-story front porch of the mansion was enclosed to create a private apartment for the elderly Mary Louise Churchill. An additional kitchen was added and large windows installed for her to behold her lovely front yard from above. Subsequently, Edward’s granddaughter, Dorothy Churchill, resided at Churchill Manor as well. During Dorothy’s tenure, many weddings and social events took place. Rumor had it that between the Depression and Prohibition, much of the Churchill family wealth disappeared. Consequently, Dorothy eventually admitted boarders into Churchill Manor to share in its beauty, as well as its expensive upkeep. Based on stories shared by former boarders, they were primarily school teachers experiencing the “Bohemian” lifestyle in their grand mansion. Following the sale of Churchill Manor in 1956, several families continued to reside on the second floor of the mansion, while renting the third floor to college students and using the first floor and grounds to host wedding receptions and other special events. 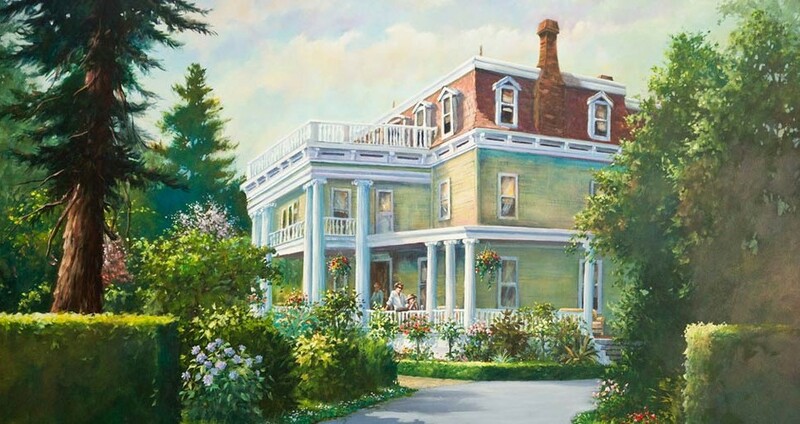 Joanna Guidotti and Brian Jensen purchased the property in 1987 and have continued the tradition of hosting travelers and weddings in the grand scale of the 1800’s. Edward Seward Churchill was born on April 6, 1842, in Rochester, New York. He graduated from Rochester University and married Mary C. Wilder on April 28, 1868. They had two children, Edward Wilder Churchill in 1870, and Mary Louise Churchill in 1872. In 1878, they arrived in Napa from Rochester. Edward S. Churchill became the Cashier of the James H. Goodman Bank, the original lending institution in the City of Napa. The bank was founded in 1858 by James H. Goodman, also of Rochester. Upon James Goodman’s death in 1888, the Bank was incorporated with $500,000 of stock, with George Goodman (James’ younger brother) and Edward S. Churchill becoming the two major stockholders, each holding equal shares in the bank. In 1917, the James H. Goodman & Co. Bank was sold to the Bank of Italy, which in 1930 became the Bank of America, the 31st branch of Bank of America. Mary Wilder Churchill, Edward wife, was related to the Goodman family. Mary C. Wilder Churchill was the daughter of Daniel Goodman and Eliza Wilder Goodman of Nashville, Tennessee. Mary’s mother, Eliza, and James and George Goodman’s father were sister and brother. Thus, Mary Wilder Churchill and George and James Goodman were first cousins. d unexpectedly in 1903. He had been afflicted with “la grippe” (akin to our modern-day flu), and had been bedridden for three days. He went to the medicine cabinet looking for some “paregoric” (a pain killer) but, in his flu-ridden delirious state, accidentally drank instead from a bottle of carbolic acid (used as antiseptic). While Dr. Hennessey and Dr. Leach were called immediately, Edward died from heart failure before reaching the hospital. He was 61 years old. Following Edward’s death, his wife and daughter, who married Edward Woodland Twitchell of Sacramento, continued to live at Churchill Manor. Dorothy Churchill (Edward’s granddaughter), resided at Churchill Manor and married twice – first to Herman Hess, second to Mr. Ewing. She had one daughter, Alice. During Dorothy’s tenure, many weddings and social events took place. Rumor had it that between the Depression and Prohibition, much of the Churchill family wealth disappeared. The history of Churchill Manor is rich and varied. We continue to update as we receive additional information from local townspeople and faraway guests. We offer our special thanks to Donald Churchill, who visited us from Louisiana. He was kind enough to share the results of his genealogical research with us, wherein he has traced Edward Seward Churchill back eight generations to John Churchill of Muston, Dorset, England, who first appeared in Plymouth, Massachusetts, in 1643.